Thank you for visiting GBC Racing! 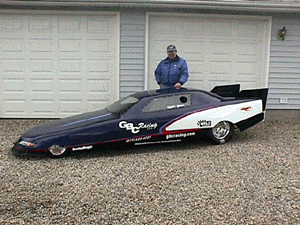 These Funny Cars have a 110″ wheel base and can be powered by 4-Stroke snowmobile, motorcycle or American V-Twin type engines. 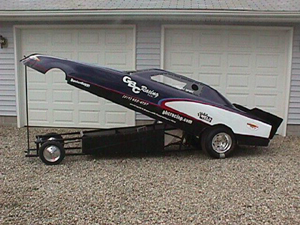 They may be a smaller version of the full size Funny Car, but they sure will pack-a-punch. 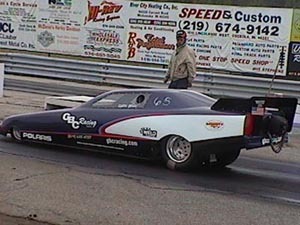 These Funny Cars are a great way for racing fans and drag racers to enjoy the fast action-packed competition of drag racing, with the size and economics kept in mind. 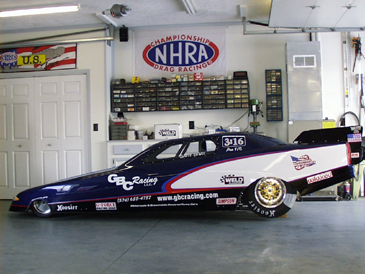 These adult driven Funny Cars are legal in NHRA and IHRA associated tracks, using the guidelines and rules of these sanctioning bodies. So for you motorcycle and snowmobile enthusiasts ready for some serious racing, join us today! These Top of the line Mini-Pro Funny Cars pack a powerful punch. Chassis’ are Certifiable to 7.50 ET in a 1/4 mile. Speeds are expected over 140+ mph. These F/C’s may only have a 110″ wheel base…but they are still a test of nerves and control! The chromoly chassis’ are fully tig welded and available through GBC Racing. Thank you Bill Blagg of Wisconsin for sharing this video of your GSXR 1000 – “the Magic Man”with us! E-mail GBC for details today! Legal Notice:GBC Racing has the right to: share, release, or market the use of any ideas, drawings, or pictures submitted to GBC Racing to better our products and safety for all of our customers.